Literary festivals are increasingly popular, but the effort and expense involved in sending an author to appear at one might never pay off. 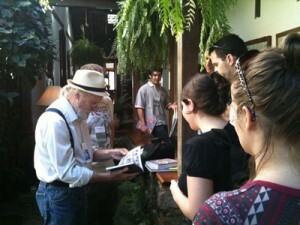 Today’s lead story discusses the Paraty International Literature Festival in Brazil. It is widely considered one of the most successful — and fun — literary festivals anywhere in the world. The piece notes that the bestselling author in the festival’s history was Neil Gaiman, who moved 600 copies. While this is a significant number — particularly for a foreign author at what is essentially a very high-brow literary beach party — it’s not an extraordinary one. Authors of Gaiman’s stature can book events that require ticket-buyers to pre-purchase books and still easily attract audiences of 1,000 or more. Literary festivals have proliferated across the globe, in cities large and small. While it may seem appealing for publishers to try and send their authors to as many as possible to generate interest and sales, there are counter arguments. For starters, when an author is just one of several dozens or even hundreds, they are not the featured attraction and the attention they get will be diluted. Then there’s the fact that few festivals offer a stipend for an author’s appearance beyond covering flight and a hotel — but if an author agrees to appear for free, are they then forgoing the opportunity to get a paid engagement at another institution nearby? Finally, there’s always the question of wear-and-tear on the author, who must endure festival appearances in addition to their regular tour schedule. Is it, in the end, worth it to eat up yet another author’s weekend to sell a few dozen more copies of their book?